The Gardens are a fun and dynamic place to volunteer. Why not get involved now? Learn more about how to enroll as a volunteer at Olbrich Botanical Gardens. Think about your interests and what you'd like to do in your free time. Do you want to get your hands dirty? Work with the public? Share a specific skill? Learn something new? What attracts you to Olbrich? Contact the Volunteer Services Manager and ask for information about specific interest areas or volunteer jobs. Each has a complete job description that includes duties, qualifications, and scheduling. Information can be mailed or e-mailed. Visit the Gardens. Talk with volunteers about what they do and what they like about volunteering at Olbrich. Current volunteers are the best spokespeople for the volunteer program. At Olbrich, we feel no one should decide to commit time to an organization before knowing what's involved. We understand that some individuals who are interested in volunteering at Olbrich may know Olbrich well, while others may be new to Madison, or just learning about this beautiful destination. To provide all prospective volunteers with the information they need before committing to a volunteer assignment, the Volunteer Services Manager requests that all interested individuals schedule a one-on-one "New Volunteer Orientation Session." First, request a volunteer application from the Volunteer Services Manager. Then, schedule a "New Volunteer Orientation Session." During this one-hour meeting, new volunteers learn how Olbrich and the volunteer program operate, while the manager learns about volunteers' interests and schedule constraints. There is no requirement that an individual sign up to volunteer at the end of the orientation. This is a chance to get informed before committing to a volunteer job. After participating in a new volunteer orientation, prospective volunteers work with the Volunteer Services Manager to find a good fit between the volunteer's interests and schedule, and the needs of the garden. Olbrich will provide a safe, supportive environment and expects that the new volunteer will do their best to respect the people, place, and policies that make Olbrich a great family destination, as described in the Code of Conduct for Olbrich Volunteers. Olbrich does not provide liability insurance for volunteers. 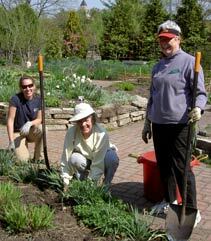 Once enrolled, Olbrich volunteers are eligible for other assignments at the Gardens. Volunteers should contact the Volunteer Services Manager to take on new assignments. Olbrich staff members greatly appreciate the work of volunteers and make them an integral part of garden operations. Like new employees, volunteers are expected to fulfill the commitments specific to their assignments in a manner that is consistent with Olbrich's mission, goals, and procedures. Volunteers with suggestions, comments, or concerns are encouraged to communicate these to their supervisor, the Volunteer Services Manager, or the Olbrich Director.